The Talos Principle is out today. It's a first-person puzzle game about lasers, computers and doing what you're told. Or not doing what you're told, as the case may be. This trailer offers a few hints as to what's inside. I've played it for a few hours, and so far have enjoyed placing jammer devices near hovering bomb-bots. Chris, meanwhile, has played it for much longer, and has some more profound and useful thoughts. He's jotted them all down in our review. 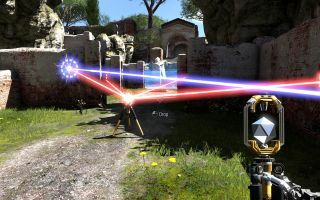 The Talos Principle is available on Steam. I'd provide a link, but if you can't work out how to get there, you're probably not ready for the game's puzzles.